The chemicals were found during a routine audit at DKIT this afternoon. AN ARMY BOMB disposal team has this afternoon made safe a number of unstable chemicals at the Dundalk Institute of Technology. The Defence Forces carried out a controlled explosion on the chemical, called celloidin wool, which was found to be unstable during a routine audit of chemicals at DKIT. 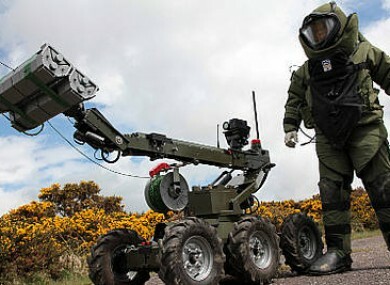 The bomb disposal team was called to the campus at around 4.10pm this afternoon after being alerted by Gardaí. The area around the scene was evacuated as the team dealt with the unstable chemical. The chemical was rendered safe at the scene and a controlled explosion was carried out to dispose of it. The scene was declared safe at 4.45pm. Celloidin wool is a chemical used in laboratories which can become unstable as it dries out. This is the 114th call out so far this year for a bomb disposal team. Email “Army team makes safe unstable chemicals at Dundalk IT”. Feedback on “Army team makes safe unstable chemicals at Dundalk IT”.